Thirty-six percent of 18-49 households with a man present own guns as compared to just sixteen percent in those households with no man in residence. Gun ownership has persistently fallen across the generations, but the proportion of people who own a gun in any specific cohort remains fairly stable over the cohort’s lifetime. With the release this week of the results from the 2018 NORC General Social Survey it seemed a good time to revisit my analyses of gun ownership patterns across the generations. This table replicates the ones found in those earlier reports with the sample expanded to include all interviews from 1972 through 2018. Here are the ownership rates for households based on the respondent’s age cohort, or “generation,” and the respondent’s actual age at the time of the interview. This method lets us see differences among generational cohorts and also measure how gun ownership changes as people age. There are few representatives of “Generation Z” in the newest data, those who born in 1997 or later and came of age beginning in 2006. Once again the major findings are clear. 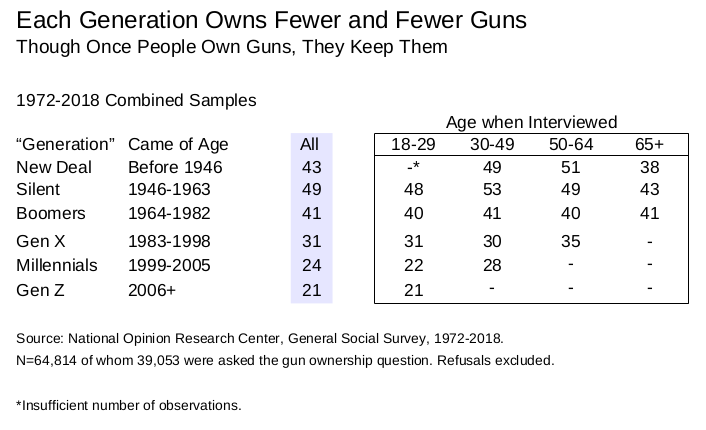 Gun ownership has persistently fallen across the generations, but the proportion of people who own a gun in any specific cohort remains fairly stable over the cohort’s lifetime. Ownership falls off among the elderly, in part because men, who are more likely to own guns, have a shorter life expectancy than women. The oldest generations have shown little change in gun ownership rates as their members aged. That may not be true for Millennials who may be buying guns as they get older. Even with that uptick among the oldest Millennials, they still remain below their Generation-X forbears. 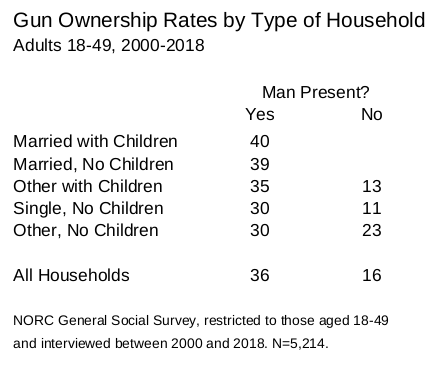 Pretty much all this growth in ownership among Millennials took place in households with a man present. Left to their own devices, women are much less likely to own a gun. This table presents the rate of gun ownership by type of household. I have limited it to adults 18-49 interviewed in 2000 or later. This pool of younger, more recent respondents represents the future of gun ownership. Thirty-six percent of younger households with a man present own guns as compared to just sixteen percent of households where no man resides. Married households show the highest rates of gun ownership, but unmarried men own guns at nearly the same rate. At the other end of the spectrum, single, unmarried women, and all women with children, have especially low ownership rates of just thirteen and eleven percent. In stark contrast, twenty-three percent of households with two or more women living alone together own guns. That is not a statistical anomaly; it is based on a sample of 833 households and is significantly greater than the 11-13% figures for the other two groups. While the National Rifle Association and other gun-advocacy groups have targeted women over the past few years, these results suggest their efforts have not borne much fruit among the younger women in this country. House Democrats have been resisting pressures from the most intensely anti-Trump part of their party who think impeachment should begin now. Congressional Democrats have instead taken a more institutionalist approach. Using its Article I oversight powers the House has opened an array of investigations by various Committees like Intelligence, Judiciary, and Oversight. Just last weekend Judiciary Committee Chair Jerrold Nadler remarked, “Before you impeach somebody, you have to persuade the American public that it ought to happen. You have to persuade enough of the – of the opposition party voters.” Nadler’s concerns are supported by the results of a new Quinnipiac poll. 59% of Americans oppose beginning the impeachment process compared to 35% in favor. However fully 66% of Democrats support starting the impeachment process now. From this poll, Chairman Nadler’s goal of persuading members of the opposite party seems far away. Only six percent of Republicans favor impeachment now, and just a third think Robert Mueller is conducting a “fair” investigation. Very different outcomes awaited the two Presidents who have been impeached in my lifetime. Richard Nixon forced to resign his office in 1974 rather than face a Senate trial. Bill Clinton was tried and acquitted by a Senate with a Republican majority. Nixon’s popularity collapsed over 1973; Clinton appeared impervious to his travails. 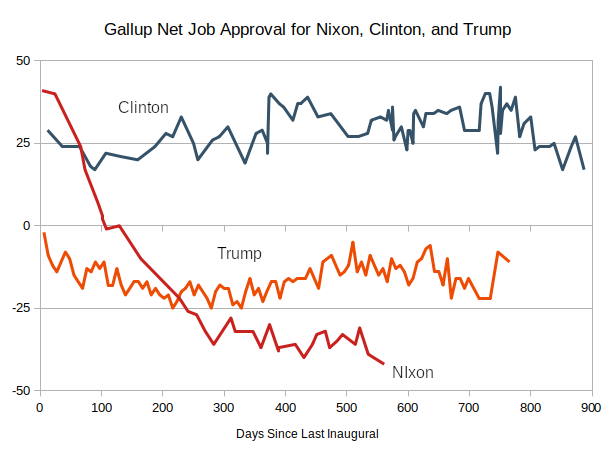 The chart plots “net” presidential job-approval (approve minus disapprove) for Presidents Nixon and Clinton using data from the Gallup Poll. To put them on a common time scale, the x-axis measures days elapsed since Inauguration. Richard Nixon was re-elected President in 1972 with 60.7 percent of the popular vote, and polls taken in the weeks just after the inauguration found about 65 percent approved of Nixon’s performance, while just 25 percent disapproved. That net approval rating of +40 exceeds Clinton’s own impressive starting position by ten percentage points. However the public’s honeymoon with Richard Nixon ended quickly and dramatically over the months of 1973, while their love affair with Clinton actually grew stronger. Just ten days after Nixon’s second inauguration, all seven of the Watergate burglars had either pleaded guilty or been convicted of their crimes. About a week later the Senate voted 77-0 to create a Select Committee on Presidential Campaign Activities under the chairmanship of Sam Ervin. The White House tried to slow the pace of events by firing three key advisors, Chief of Staff H. R. Haldeman, Domestic Counselor John Ehrlichman, and White House Counsel John Dean, on April 30th (day 100 in the chart). A few weeks later Dean began his stunning testimony before the Select Committee (day 156) followed by the even more stunning revelation from Deputy Assistant to the President Alexander Butterfield that all Oval Office conversations had been recorded. Legal wrangling over the tapes ended up before the Supreme Court. The pale red line marks the so-called “Saturday Night Massacre.” On October 20, 1973, Nixon instructed Attorney General Elliot Richardson to fire Watergate Special Prosecutor Archibald Cox. Richardson and his deputy, William Ruckelshaus, both resigned rather than comply with the President’s request, leaving the task up to Solicitor General Robert Bork. Despite Cox’s ouster, it took only eleven days before Nixon was pressured to appoint a new Special Prosecutor, Leon Jaworski. Nixon’s popularity continued to decline after the Massacre, but not at the astounding pace it had fallen in the months before. The contrast between Richard Nixon and Bill Clinton could not be more stark. Clinton’s began his second term with a 30-point margin in net approval. That margin actually increased over his term despite Independent Counsel Kenneth Starr’s repeated investigations. His original remit was the so-called “Whitewater” investigation concerning a real-estate deal in Arkansas. That investigation expanded to include “Travelgate” concerning alleged corruption in the White House Travel Office. Starr even took seriously right-wing claims about the alleged murder and subsequent cover-up of Clinton aide Vince Foster. Starr later concurred with the verdict that Foster’s death was a suicide. Ultimately, though, Starr’s investigations led him to Clinton’s alleged sexual escapades with Paula Jones and Monica Lewinsky. Starr subpoenaed Clinton to testify before the grand jury, where the President mediated on the meaning of “is.” Starr believed Clinton committed perjury during the grand jury hearing and reported this finding to Congress where it became the basis for the House impeachment proceedings that began on December 19th. To the perjury charge the House later added an obstruction of justice count and sent the Bill of Impeachment to the Senate where a trial began on January 7, 1999. 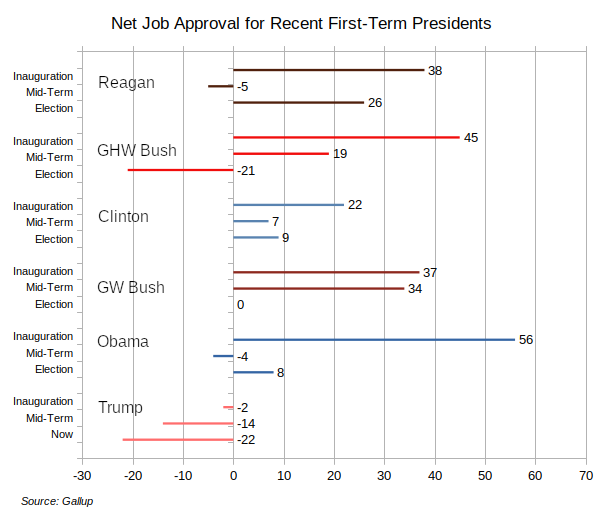 Despite all this furor, Clinton’s net job-approval rating hovered between +25 and +35 from his second inaugural through impeachment. Ironically, Clinton’s best performance on Gallup’s job-approval question came at the same time as the Senate began to deliberate on the two impeachment counts. 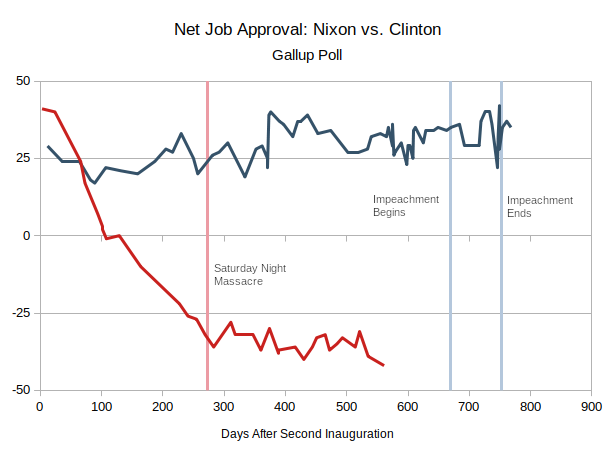 Opinion did fluctuate more during the impeachment process, but average net approval remained roughly constant throughout. (If only public opinion mattered, the Republicans’ decision to impeach Clinton makes little sense. Perhaps Republican leaders believed they could hold their caucus together in the Senate, but Clinton’s overwhelming popularity made it easier for defectors like Susan Collins (R-ME) and Richard Shelby (R-SC) to cross the aisle on Clinton’s behalf. If we add Donald Trump’s net job approval, two things stand out right away. While more people disapprove than approve of Trump’s performance in office, he has not reached the depths of unpopularity that we saw when Richard Nixon was President. Second, like “Slick Willie” Clinton, Donald Trump’s popularity seems remarkably impervious to events. In such circumstances, it makes sense for Democratic leaders to take their time pursuing impeachment. The public is not ready. I have updated the datasets made available here. There have been eleven midterm elections when House retirements by one party outnumbered those of the other party by six or more seats. 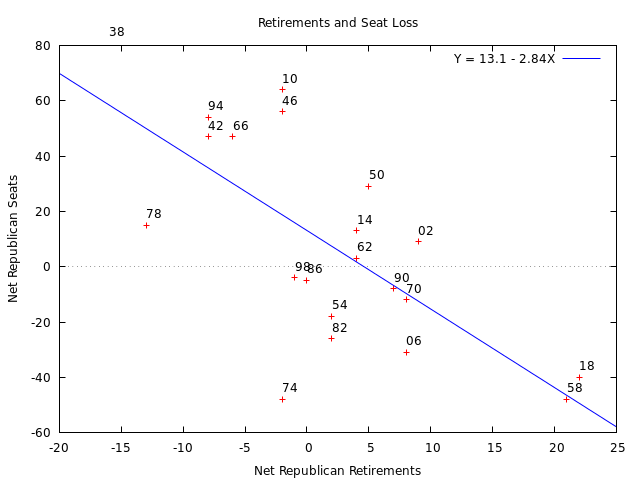 In all but one election the party with the greater number of retirements lost seats. In the months before the 2018 election forty Republican House Members chose to give up their seats rather than pursue re-election, by far the greatest Republican exodus since the New Deal. The previous Republican record of twenty-seven was set in 1958 during the Eisenhower recession. Democrats once saw forty-one of their Members choose to depart the House in 1992 when Clinton was first elected. 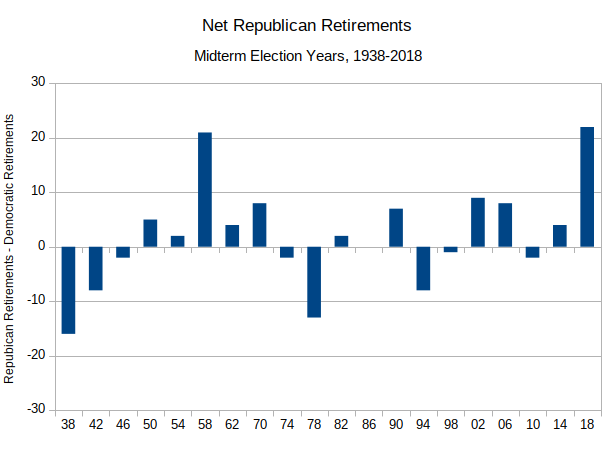 However it is not the volume of a party’s retirements that matter as much as the excess of retirements from one side of the aisle or the other. To be sure, Members of Congress retire for many reasons. Age and illness catch up with the best of us. Some Members give up their House seats to seek higher office like Kirsten Sinema and Beto O’Rourke did this year. Still, Members also pay close attention to the winds of politics for fear they might be swept out of their seats. Some choose to retire rather than face an embarrassing defeat in the next election. Such “strategic retirements” might prove a plausible bellwether for future elections. If many more Members of one party are leaving their seats than the other, that might bode ill for the party’s results at the next election. One thing is certain, retirements prove useless for predicting House results in Presidential election years. Presidential politics overwhelms any effect we might see for strategic retirements in House elections. The picture looks different in midterm elections. Years that saw more Republicans retiring compared to Democrats were also years where more seats swung from Republican to Democratic hands. This past election joins 1958 as years when an excess of Republican departures from the House foretold a substantial loss of seats at the next election. The horizontal axis measures the difference between the number of Republican Members who left the House before an election and the number of Democrats who gave up their seats. * The vertical axis shows the swing in House seats compared to the past election. For instance, in 2018 forty Republicans and eighteen Democrats left the House, for a net retirements figure of +22 Republican. The “blue wave” swung forty seats from the Republicans to the Democrats, about nine fewer than the best-fit line would predict. Some readers might ask whether that nine-seat deficit reflected Republican gerrymandering in the years since the 2010 Census. I simply cannot say. 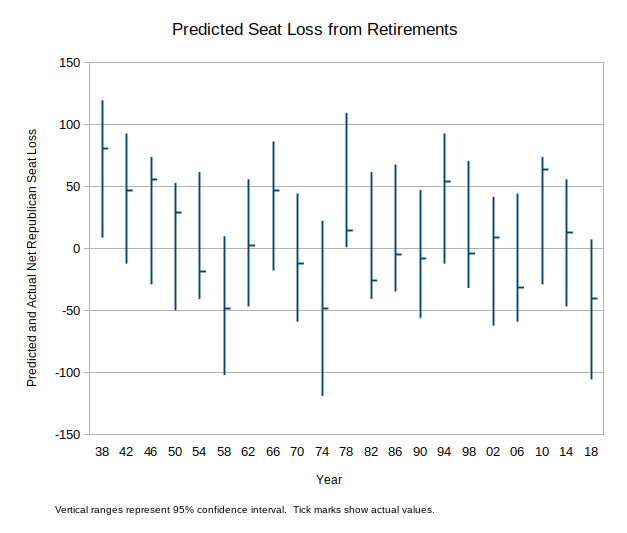 The likely error range (the “95% confidence interval”) around the prediction for any individual year averages about a hundred seats. ** With that much variability, detecting things like gerrymandering effects is simply impossible. As a bellwether, then, retirements seem pretty useless. They appear to have so much intrinsic variability that any effects of strategic decision-making by Members remain hidden. 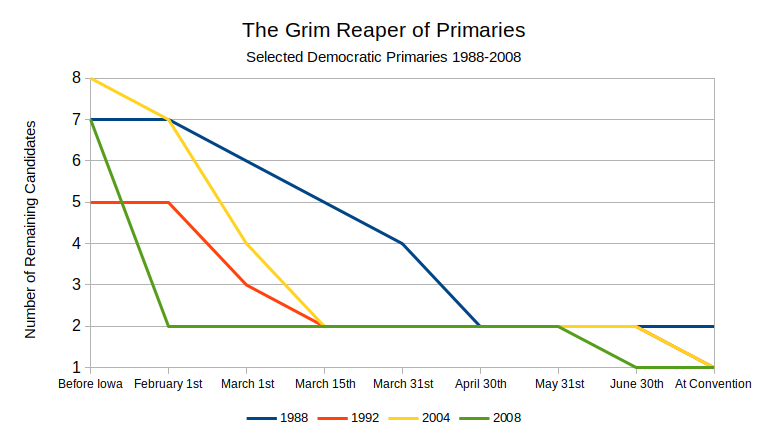 Suppose we group elections by the difference in retirements. Will we see any stronger relationship with the election result than we have so far? In the six elections where the number of retiring Republicans outnumbered retiring Democrats by six or more Members, the Republicans lost seats in five or them. The same held true for elections when six of more Democrats retired compared to their Republican colleagues. The Republicans gained seats in all five of those elections. So retirements can prove a useful predictor of future election results if we limit our attention to the more extreme years where one party’s retirements outnumber the other by six or more. The party with the excess of retirements has lost ten of the eleven elections fought in such circumstances. *The data on Congressional retirements come from the Brookings Institution’s invaluable Vital Statistics on Congress. The figure for 2018 come from the New York Times. **The height of the bars depends on the overall “standard error of estimate,” in this case 23.8 seats, the size of the sample (21 elections), and the difference between the number of retirements in a given year and the mean for all years. 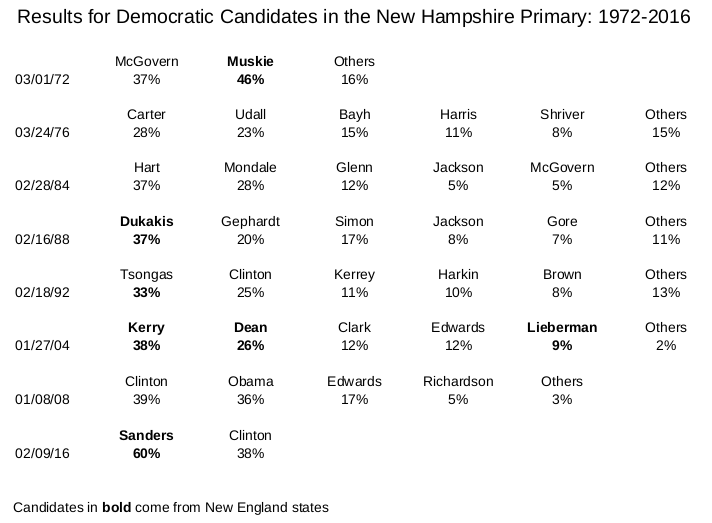 The confidence intervals average about plus or minus fifty seats for any given election. Americans saw their real disposable personal incomes grow by a fairly average two percent over the past year. With that mediocre rate of income growth, a “normal” President would have had an approval rating around forty-eight percent at the time of the election. Donald Trump’s forty percent favorability probably cost his party at least four percent of the popular vote, or about half the Democrat’s popular-vote margin of just over eight percent. The state of the economy was considered one of the few items on the positive side of the ledger for Congressional Republicans in 2018. The stock market accelerated after Trump’s election in 2016; the new tax bill was expected to put cash in peoples’ pockets; and, incomes overall continued to rise as they had since 2010. All of these should have helped Republicans this year. The question is how much. The effect of the stock market rise is somewhat easy to dismiss as only half of American adults own stocks. And the market has experienced considerable volatility this year compared to the steady march upward during the first year of the Trump Administration. So while the half of Americans with stock portfolios are certainly better off today than they were in November of 2016, the future looks more dicey. However the evidence for a relationship between stock prices and presidential popularity is, at best, mixed. Back in 2009 Gallup found little correlation between the Dow-Jones Industrial Average and the popularity of recent Presidents. Nate Silver at FiveThirtyEight also expresses skepticism about a stock-market effect. As I’ve discussed here before, political science research often treats changes in real per-capita disposable personal income as a useful shorthand for the economic welfare of an “average” American. That measure turns out to have a weak, though measurable, influence on Presidential popularity. This chart presents Gallup’s job-approval measure in the week or two before an election and the one-year change in real per-capita disposable income as reported by the Bureau of Economic Affairs. 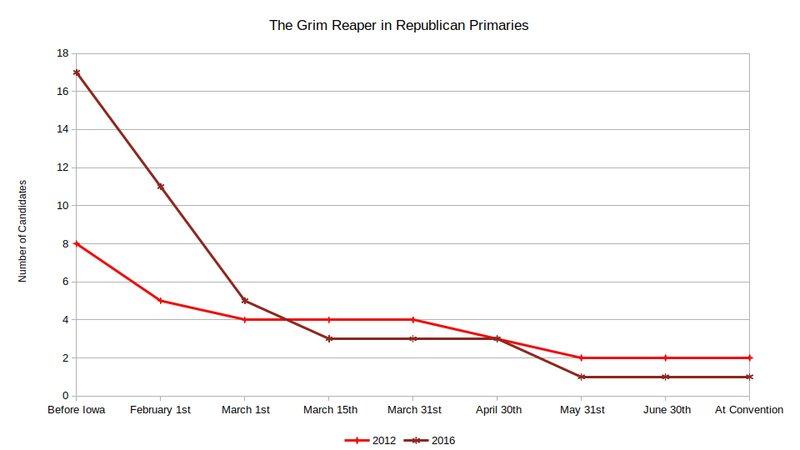 I use the third-quarter figure since it covers the period closest to an election. The scatter around the line in this chart testifies to the weakness of the relationship. The R2 value measures the percentage of the variance in approval that can be accounted for by income changes; here it is about eleven percent. 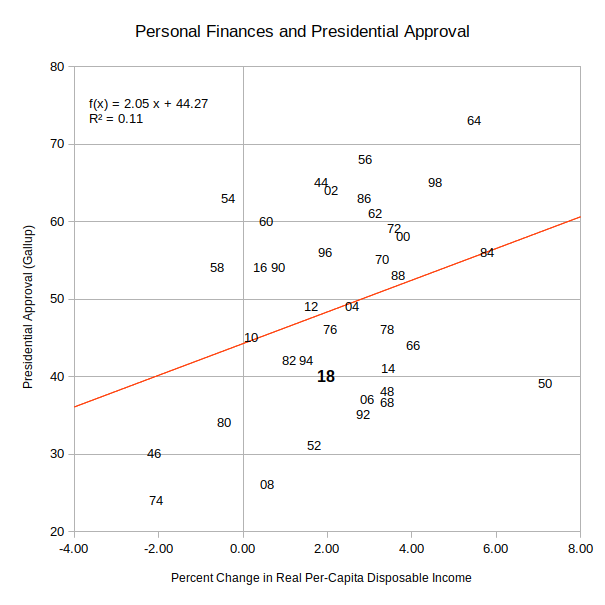 The slope of the regression line, two, suggests that a one-percent increase in real disposable personal income is associated with, on average, a two-point improvement in a President’s popularity. One thing made immediately clear by this chart is that average Americans saw no extraordinary growth in their incomes over 2018. Real per-capita disposable income grew from $42,866 in the third quarter of 2017 to $43,718 at the end of September. That gain of $852 was just short of a two-percent increase over the year before, and a bit below the 1944-2018 historical average of 2.25 percent. Still, the chart shows that Trump was less popular than economic conditions would predict. Approval for a “typical” President presiding over an economy showing two-percent in growth should run a bit over 48 percent, not the 40 percent for Trump reported by Gallup in the week before the election. Earlier this year I presented some results that tied together Presidential popularity and support for the President’s party on the so-called “generic-ballot” question. * We can use that model to imagine how the election might have transpired had Trump been a “normal” President and an economy with two-percent personal income growth. 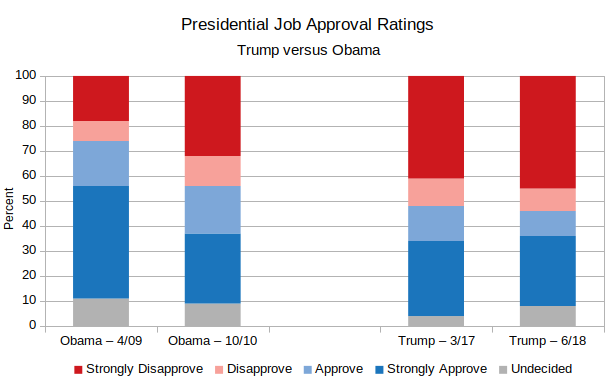 In that model a one-percent change in “net approval,” the difference between the percent approving versus that disapproving of the President, improves the Democrats’ margin on the generic-ballot measure by about 0.3 percent. Trump’s net-approval rating just before the election stood at 40-54, or -14, according to Gallup. A President with 48 percent approval will likely have an identical disapproval rating, 48-48, after accounting for the four percent or so who report having no opinion. That makes the net approval for this hypothetical President zero, meaning Trump’s net approval is fourteen points below a normal President’s. Trump running fourteen points behind a normal President on net approval probably expanded the Democrats’ margin in the popular vote for the House by about four percent (4.2 = 0.3 X 14). That accounts for half the Democrats’ margin of victory in November, 2018. *The generic-ballot again did a pretty good job of predicting the actual margin of victory in the election for the House of Representatives. The RealClearPolitics average of generic-ballot polls showed the Democrats with a lead of 7.3 percent. Omitting the obvious Rasmussen outlier, which predicted a one-point Republican victory, brings the average up to 8.2 percent, nearly identical to the actual margin of 8.5 percent. Democrats have won, on average, about eight fewer seats in each election since 2010 than we would expect given their popular vote. The surge in Democratic votes this year might have cut that deficit down to two, but it is more likely there was no effect at all. Before the November election, some commentators argued that a surge in turnout could negate the effects of Republican gerrymandering after 2010. Of course, this argument only makes sense if there were a larger increase in Democratic turnout than Republican turnout. A proportional increase for both parties would leave the seat results unchanged. 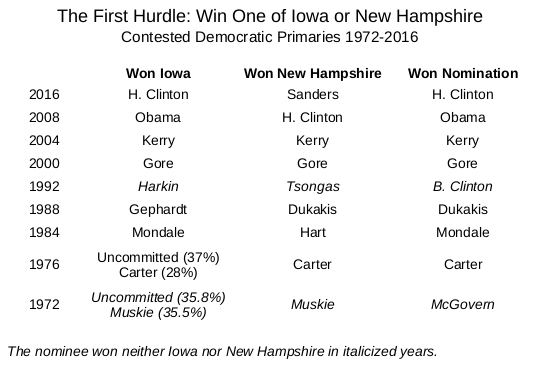 Was this surge in Democratic turnout sufficient to overcome the 2010 gerrymander? To test this, I added a term for the 2018 election to my standard model of seats and votes described here and here. I use the “logits” of Democratic seats and votes won with “dummy variables” to represent reapportionment periods. The basic model, with 2018 included, produces this chart showing the number of Democratic seats won or lost compared to what we would expect based on the national popular vote won by that party. Some periods, like 2002-2010, show no significant excess gains or losses. Others like 1942-1950 and 2012-2018 show substantial effects. In the five elections beginning in 1942, Democrats routinely won nearly nine more House seats than their popular vote would predict. Republicans picked up a number of state legislatures in the 1952 election and erased this deficit for the decade to follow. 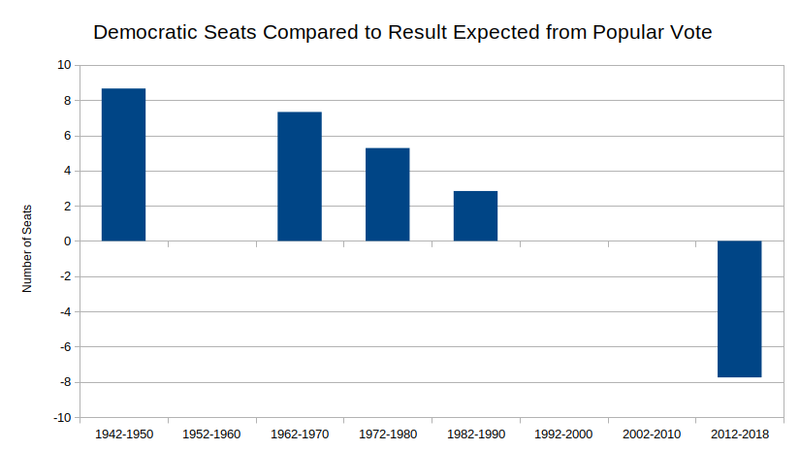 From 1962 through 1990, Democrats were again advantaged, but by a diminishing margin over time. 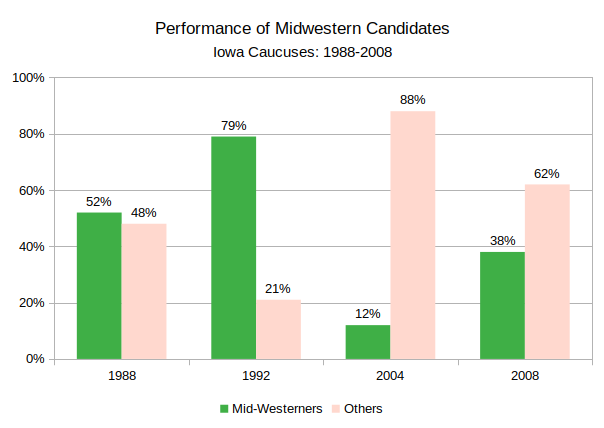 The elections fought between 1992 and 2010 showed no systematic bias for either party After the 2010 Census and the “shellacking” of Democrats in both national and state elections that year, Republicans were able to draw district maps that gave their party just short of eight “excess” seats in the House. By adding another variable to represent just the 2018 election, it does indicate a diminished effect compared to the 2012-2018 average. However this effect fails to reach any conventional level of statistical significance (t = 1.07). One other question we might ask is what the 2018 outcome would have been had the neutral results for 1992-2010 continued on into elections held since the 2010 Census. While the chart above shows that Democrats lost on average about eight seats to gerrymandering beginning in 2012, the estimated effect for this past election is just short of fourteen seats, the result of the Democrats’ substantial victory in the popular vote.